The NRC introduced a series of educational brochures, the Safety Culture Trait Talk, at the March 2014 Regulatory Information Conference. 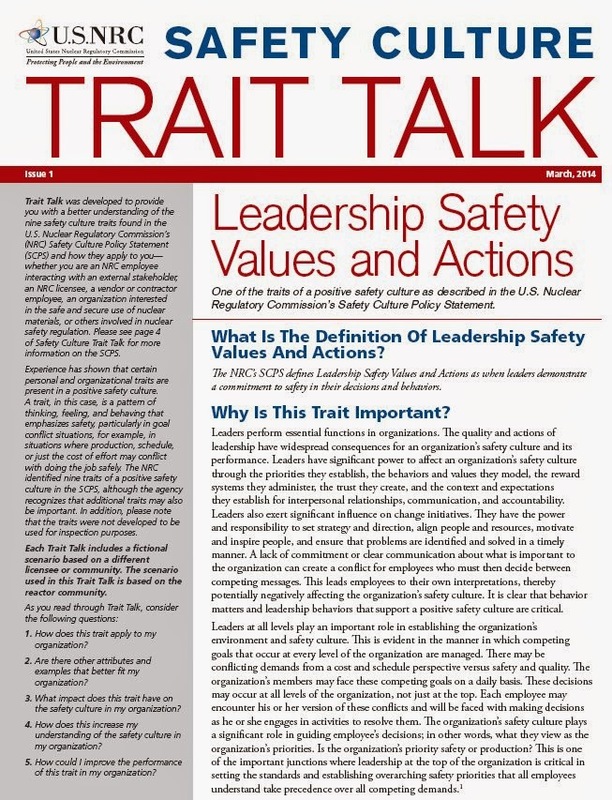 Each brochure covers one of the nine safety culture (SC) traits in the NRC SC Policy Statement (SCPS), describing why the trait is important and providing examples of related attributes and an illustrative scenario. At that time, only one Trait Talk was available, viz., Leadership Safety Values and Actions. We thought the content was pretty good. The “Why is this trait important?” portion was derived from an extensive review of SC-related social science literature, which we liked a lot and posted about Feb. 10, 2013. The “What does this trait look like?” section (aka attributes) comes from the SC Common Language initiative, which we have reviewed multiple times, most recently on April 6, 2014. The illustrative scenario is new content developed for each brochure. During 2014 and early 2015, NRC published additional Trait Talk brochures and now has one for each trait in the SCPS. * We reviewed them all and still believe they provide a useful introduction and overview for each trait. Following is our take on each trait’s essence (based on the brochure contents), and each brochure’s strengths and weaknesses. This trait focuses on controlling work. It emphasizes limiting temporary modifications, minimizing backlogs and adhering to procedures, which is all good. It also says “organizations may require strict adherence to normal and emergency operating procedures. However, flexibility may be necessary when responding to off-normal conditions.” This may give the purists heartburn but it reflects reality and is a major observation of the Fukushima disaster. This trait is about avoiding complacency, watching for abnormalities while going about one’s duties and stopping work if unexpected conditions or results are encountered. The key is ensuring safety has its appropriate priority at all times, which is not easy if a plant is under significant financial or political pressure. This trait is about identifying and permanently resolving current problems, and anticipating potential future challenges and dealing with them before they manifest. In our view, this is one of the two most important areas (the other being decision making) where everyone sees what a plant’s real priorities are. This Trait Talk covers the topic well. The trait is about establishing and maintaining a safety conscious work environment (SCWE). The Trait Talk lays out the theory but the truth is whistle-blowers in many industries, including nuclear, become pariahs. This trait is about transparency (although the term does not appear in the brochure.) All business communication should be clear, complete, understandable and respectful. The Trait Talk’s discussion on the importance of first-level supervisors being a primary source of information for their employees is very good. The title says it all about this trait which overlaps with others, including questioning attitude, SCWE and transparent communications. The Trait Talk has a good discussion of trust, at both the individual and organizational level. One aspect we would add to the trust “equation” is the perception of self-interest vs. concern for others. This trait is about identifying, obtaining, sharing, applying and retaining new knowledge that can lead to improved individual or organizational performance. This trait overlaps with others, including questioning attitude and a respectful work environment. This trait is mostly about everyone’s willingness to accept responsibility for safety but it also encompasses assigned individuals’ obligation for specific safety responsibilities. For the latter case, the brochure’s statement that “Personal accountability is not finger pointing, blame, or punishment” is simply not true. The brochures provide a useful introduction and overview for each trait in the SCPS. The content is generally good, with some weak spots and missing items. These are, after all, four-page brochures and roughly 45 percent of the content is the same in every brochure. * All the Trait Talk brochures can be downloaded from the SC education materials page on the NRC website. ** Interestingly, Decision Making is included as a tenth trait in NRC NUREG-2165, “Safety Culture Common Language” (Mar. 2014). ADAMS ML14083A200.